Serum ketones are typically unnecessary in the Emergency Department for the diagnosis and management of DKA. However, there may be uncommon situations where they can be beneficial. Additional tests should be guided by the clinical picture. Infection is an important precipitant to DKA and should be specifically sought when an alternate precipitant is not known. Establish at least 2 peripheral IVs as patients typically require multiple medication and infusions. Cause: it is unclear what causes patients to develop cerebral edema. Retrospective literature has shown association between initial bicarbonate levels, administration of bicarbonate, fluid administration etc but no causality has been shown. Always search for the underlying cause of the patients DKA presentation keeping in mind that infection is the most common cause. CanadiEM: Is NS the Coke of Crystalloid Fluid? 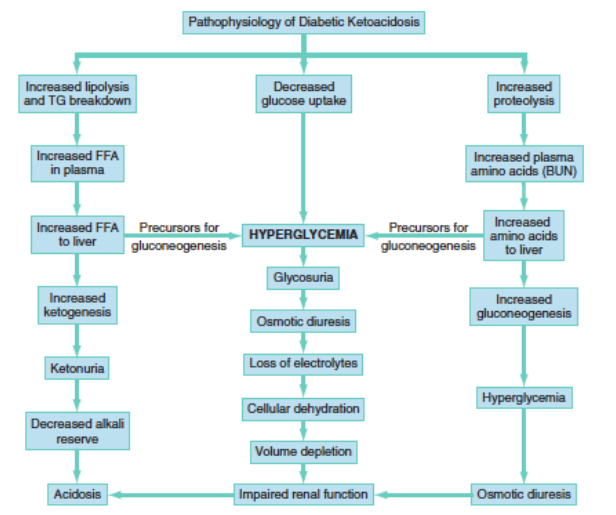 Cydulka RK, Maloney GE: Diabetes Mellitus and Disorders of Glucose Homeostasis; in Marx JA, Hockberger RS, Walls RM, et al (eds): Rosen’s Emergency Medicine: Concepts and Clinical Practice, ed 8. St. Louis, Mosby, Inc., 2014, (Ch) 126: p 1652-1668. How is the process of changing from IV insulin to subcutaneous insulin? Henrique – I’ll admit that I rarely do this in my place. Patients move to the ICU fairly quickly. Do you have a protocol you use? in the ER where I work, once DKA is resolved, we start them on long acting insulin an hour before we shut off the insulin drip… then it becomes a sliding scale insulin administration set up with accuchecks q2hours.